MarLa studio: Welcome to the (Pretty!) Machine. I saw the future of cool commerce and its name is the ipad.... and Square. Every once in a while I happen upon something so brilliant and intriguing I stare with wide eyed wonder - as if I'm seven all over again, looking up at the John Hancock building from it's sidewalk base. Recently, I experienced this all too rare childlike fascination when paying at my new favorite, sleek coffee shop - Coffee Lab - at 922 Noyes Street, Evanston, IL. 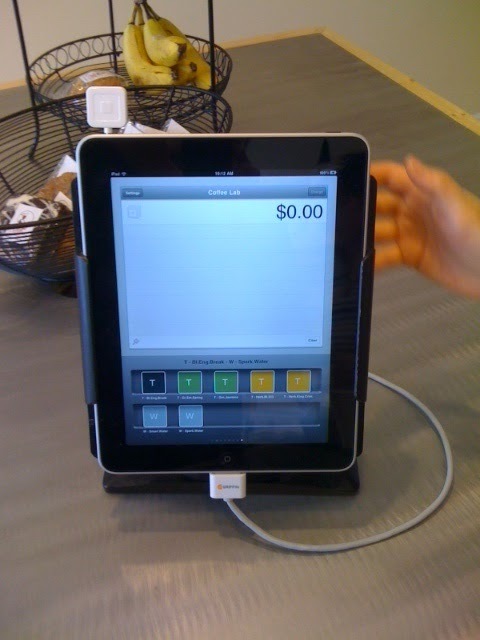 This is a pic of Coffee Lab's cash register - an ipad with an attached device called Square. Square is a card swipe technology that can be used with ipads, iphones, and andriod phones, turning them into little credit card terminals. The Square hardware and app are free. You just set up an account and you're in business. Processing fees are less than conventional plans, and you don't need a merchant services agreement. Yes - wow, wow, and WOW - my thoughts exactly! I now have a square for my phone. Most importantly, it looks beautiful - much like the Jetsons world I'd imagined "the future" to be when I was seven. I'm still waiting for spunky round hover-cars, and responsible apron-clad robot maids... but, I've got a little cube and a phone that takes pictures... and credit cards!